1. (Don’t) beat it: Overbeating your batter toughen up your pancake mixture. Rubbery pancakes are not what we’re looking for here, so mix the ingredients just to combine—lumpy batter is okay. 2. Let it rest: For the lightest, fluffiest interior, you’ll need to let your batter rest so that the flour is fully hydrated and there's time for the gluten to develop. A minimum of 30 min. is the rule of thumb, but any time is better than no time, so don’t punish yourself if breakfast hunger pangs force you to move a little quicker. 3. Grease, don’t coat: Use paper towels to grease the pan, be it butter or oil, which will help your pancakes cook until they’re evenly golden and prevent them from burning before they’re cooked through. Before you add the fat to your pan (make it a non-stick one), make sure it’s well heated, and don’t worry if the first pancake in the pan looks a little lackluster, the universal truth that’s the first pancake never turns out is actually not a bad thing—simply save it to nibble on while the rest of the batch flips its way onto plates. 4. Flip it good: Stick to medium-heat and only flip your pancake once the entire surface is dotted with telltale bubbles. 5. Stay warm: Rather than chaining one person to the stove to flip endless pancakes, if you’re entertaining, or would actually like to enjoy your breakfast while it’s hot and fresh, put your oven on low or warm and place the pancakes on a plate in the oven as they’re ready. Cover them with a clean kitchen towel to keep them from drying out, and they’ll be as good as new once the entire batch is ready to hit the table..
Get the maple syrup at the ready! American pancakes get their height and fluffy interior from the addition of baking powder—making them the perfect sponge for maple syrup to seep into and my excuse to pour on ever more. In this recipe for Russian oladi pancakes, submitted by one of our community members, a touch of acidic vinegar, rather than buttermilk, is added. The batch are cooked as smaller, thinner medallions that stack beautifully. Nothing rises quite like a Japanese-style pancake—soft and soufflé-like inside and crispy on the outside, these are sure to earn points on your brunch menu. Love banana bread? Pancakes, too? 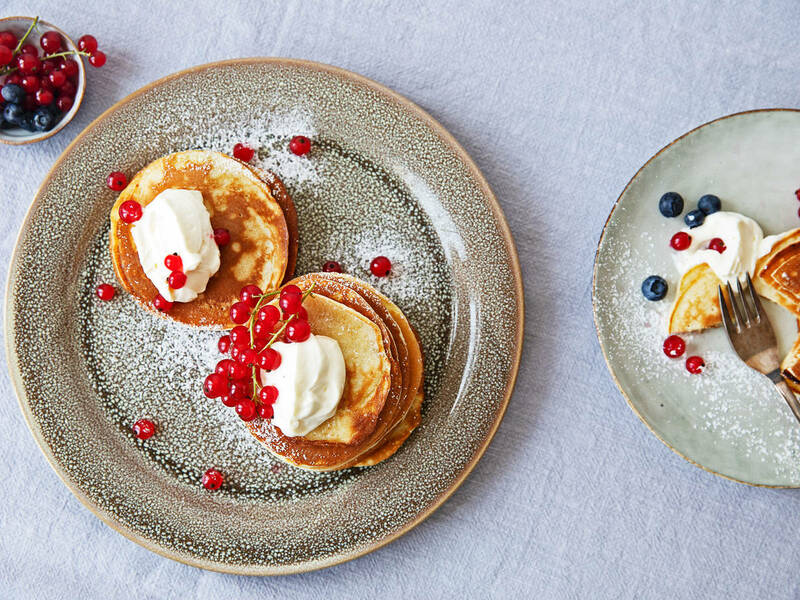 This is a great 2 for 1 recipe for the indecisive and a fun spin on regular pancake-y fare. Caramelized walnuts and apples plus pancakes equals, well, a pretty good breakfast. These apple pancakes are especially notable for those who find pancakes a little one note in the texture department. Roll up, roll up—the Swedes are at it again. These elegant, bite-sized pancakes are rolled and stuffed with banana and melted chocolate and make a great prep-ahead addition to a brunch spread. OK, I realize it’s not quite a fruit, but can is there any other ingredient that has as much sweet to savory versatility as pumpkin? Trusty pumpkin puree gives this recipe texture and flavor with all the usual spices to dial up the flavor—and if you need any more convincing—there’s also bacon. This recipe uses almond milk, coconut flour, whole wheat flower, amaranth, and a pinch of cinnamon to pack in more flavor than your usual pancake batter—so whether you’re vegan or looking for something a little different, this one’s for you. Who said gluten-free meant a winding list of ingredients? These simple 3-ingredient paleo pancakes are a go-to recipe easy enough to commit to memory! A favorite starter that flies off the plate at Chinese restaurants worldwide has to be the scallion pancake. So why not recreate the joy and try your hand making them at home? Some might argue that we’re hedging into fritter territory, but in the spirit of showing just how much you can do with a simple pancake batter, I’m leaving this recipe for zucchini and parmesan pancakes right here. If you feel like more, try their Romanesco cousins, too. Crispy, oniony potato pancakes are a savory dish that can be skewed sweet—try pairing them with smoked salmon and horseradish or even a dollop of applesauce. Chickpea flour pancakes, also known as socca, are the perfect foil for savory toppings and make a filling meal any time of day. I love the nutty flavor the chickpea imparts and the recipe below, with crunchy fennel and olives, really hits the mark. Plus, the whole dish is as simple as 5 ingredients. One of the most fun recipes for communal eating has to be build-it-yourself duck pancakes. There’s just the right amount of crunch and chew in every mouthful and for condiment lovers, any opportunity to dip into loads of hoisin sauce is a good one—isn’t it? Have we satisfied your appetite for pancakes? Let us know your favorite kinds or your secret tips in the comments! If you have a winning recipe you’d like to share with the Kitchen Stories community, send it to community@kitchenstories.com for your chance to be published.